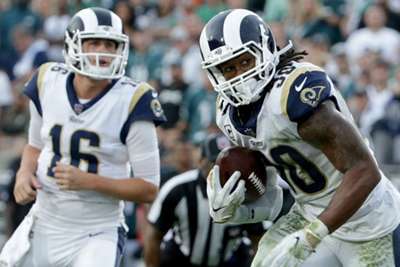 The Los Angeles Rams are among the five designated hosts for the NFL 2019 International Series games, the the league announced Wednesday. Four games will be played in London and one in Mexico City, which saw its annual NFL game moved to Los Angeles this year because of poor field conditions at Estadio Azteca. That meant a 105-point thriller between the Rams and Chiefs was played at L.A.'s Memorial Coliseum instead. Along with the Rams, the Chargers, Buccaneers and Raiders also will serve as home teams, as will the Jaguars, who have played a home game at Wembley Stadium every year since 2013. The three London games this year saw the Seahawks beat the Raiders, the Chargers defeat the Titans and the defending Super Bowl champion Eagles down the Jags. Details of who the five home teams will face next regular season will be released in the spring, the NFL said.